"I've always loved mixing comedy and food. 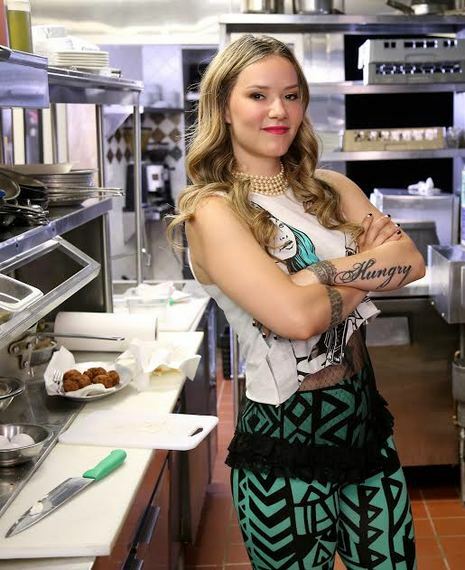 A road trip version of Bitchin' Kitchen seemed like the natural evolution of the show," Cooking Channel's Nadia G said Wednesday in an interview with The Seattle Lesbian. "We're taking our antics on the road," Nadia said. "I love having someone to bounce off of -- someone to torture. We get the chefs to rap with us and we dig things up about them on Facebook and Twitter and hold it over their heads in the kitchen." Nadia grew up in a boisterous Italian family that never quite gave up the belief that Casalinga-style cuisine is the center of the Universe. "You don't have to look far to taste some of the best food the world has to offer," Nadia said. "I'd pit my grandmother against a three-star Michelin chef any day." "I had a pretty interesting time in Louisville, Kentucky," she said. "They really understand the concept of Farm to Table - and not just with a trendy sticker on an item at Whole Foods. It's their way of life. I love seeing chefs that know their food." "Food is an extension of our personalities," Nadia said. "It's fun to meet the chefs and see them express that side of themselves." Nadia hasn't come across anything she hasn't liked herself just yet. And from the sound of it, she might not -- ever. "The problem is that I like everything," she said. "With this show, I have pulled pork for breakfast and organic mac and cheese for lunch." "It's called 'My Bra Don't Fit No More,'" she said. "I don't! You know what? I've given up!" she said. One might wonder if the stars of cooking shows get to actually eat the food they spent so much time meticulously preparing. Without missing a beat, Nadia shared, "Oh, you definitely get to eat the food! I've been tasting some of the best food from some of the best chefs in the country -- little guys who raise their own pigs and livestock and prepare some of the best meals right in their own backyards." Nadia's fans can create their own unique recipes along with the star by picking up her best-selling book, The Bitchin' Kitchen Cookbook: Rock Your Kitchen and Let the Boys Clean Up the Mess (skirt!, 2009). Check out Nadia in Bite This on The Cooking Channel beginning Monday, July 14 at 10 p.m. and on Facebook where Nadia says she posts "all of her photos" when she's drunk. Photos in this story courtesy of Cooking Channel.